Download IBPS SO Previous Papers and Solved Answer Key. Check IBPS Specialist Officer Exam Paper for the better exam preparation. There are a lot of students searching for the Institute of Banking Personnel Selection IT Officer Model Question Papers. With the IBPSC CWE SO Solved Question Papers one can have the better preparation for the Written Exam. So the candidates can go through the following sections of the page to download IBPS Previous Year Question Papers with the Banking preparation tips to have a better preparation for the Exam. In the following sections, we have also provided the ibps.in Syllabus and new Exam pattern for various posts. So check the complete information and start preparation according to the exam pattern. IBPS SO Previous Papers are provided here. You are on this page, means you are one of the students who have applied for the IBPS SO Recruitment who is searching for the Specialist Officer Solved Question Papers for their preparation. For all those candidates, we have provided the IBPS IT Officer Sample Question Papers with Solutions. So teh candidates can download the papers for the Banking Written Exam. With the papers we have given here, you can easily get the knowledge from the previous year Exams. Solving the questions from the last year exam papers will give you the better time management which helps you in the Online written Exam. So practice the more questions and crack the IBPS Written Exam for the Specialist Officer Post. Institute of Banking Personnel Selection has released a recruitment notification for the students preparing for the Banking Exams. There are totally 1315 Specialist Posts from various categories. There are various posts including IT Officer, Rajbasha Adhikari, Law Officer, etc. IBPS Online will be started from 7th November 2017 and the last date to apply for these IBPS jobs is 27th November 2017. You will have only 20 days to apply for this IBPS SO Recruitment 2017. So the candidates are suggested to apply for these before getting too late and start the Exam preparation. In the following sections of the page, we have provided the latest Exam pattern and solved question papers from the previous year exams. So the aspirants can get the complete details and have the proper preparation. Exam Pattern differed for the various posts. From the above tables, you can understand the subjects included for the Exam. As well as you can also check the number of questions and marks allotted for each section. There are some common subjects for every post like English, General awareness with the reference of Banking, Reasoning. Each section has equal priority. Except for the languages, other subjects will be asked in both the English and Hindi Mediums. Language subjects will be asked in their Respective mediums. You will have 2 hours time to complete the Exams. As it is an IBPS Exam, there will be few rounds of selection. There will be Written Test and Interview for the Specialist Officer Exam. In the Written Test, you will have Both Prelims and Mains. The one who qualifies in the Prelims will be shortlisted for the Mains followed by Interview. So each and every round is important in this IBPS Selection. So the candidates are suggested to concentrate on all these rounds and get the job of Specialist Officer. Check IBPS Specialist Officer Syllabus here. Candidates applied for the IBPS SO Exam are now are in search of Exam Syllabus and Exam Pattern. For all those, we have provided the complete subject wise ibps.in syllabus with the Latest Exam Pattern. Therefore students searching for the syllabus and Exam Papers can make use of this article. Here you can get the section wise IBPS Exam syllabus and Exam pattern for both the prelims and Mains. So you can use the syllabus and start the Exam Preparation. IBPS SO Previous Papers are provided here. There are a lot of students who have applied for the IBPS SO Exam and started their preparation. For this, they need to have IBPS IT Officer Exam Papers. So for the candidates searching for the Officer Scale I Solved Question Papers are at the right place of searching. Here we have provided the set-wise IBPS CWE SO Old Question Papers with Answer Key. So the aspirants can check download these Model Papers PDF for having a better preparation for free of cost. Download the IBPS SO Exam Papers here. The papers provided here will help you to have a better preparation for the Bank Exam compared to the other students. So the applicants of IBPS Recruitment can download these IBPS SO Previous Papers and start their Exam Preparation. These are all the sample question papers which help you in better preparation. If we find the more papers, we will update on our site. IBPS SO Previous Papers Displayed for Free Download. 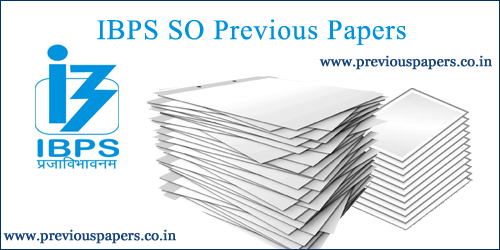 Obtain Last 15 Years IBPS Specialist Officer Old Question Papers with Solutions. Get IBPS SO Systems Exam Model Papers also. Download IBPS SO Assistant Manger Solved Papers by using free download links. Practice provided IBPS SO Sample Papers for good result. Also, grab IBPS SO Practice Papers in the following sections. Check New IBPS SO Exam Pattern along with Study Materials, Preparation Tips, and Practice Papers on this previouspapers.co.in web page. Institute of Banking Personnel Selection SO Exam Papers are Available here for preparation purpose. Aspirants have a look on this page to grab IBPS SO Assistant Manger Systems Previous Question Papers Pdf. We have provided all IBPS Specialist Officer Systems Solved Questions with exact answers. So, candidates can utilize the provided IBPS SO Previous Exam Papers for effective preparation. Candidates can also download IBPS SO Sample Papers to add the extra boost to your regular preparation. Aspirants can practice IBPS Specialist Officer Model Papers as much as you can. This IBPS Previous Papers preparation will helpful for the candidates to gain good marks in the exam. So, interested candidates can download and then practice well the IBPS SO Sample Question Papers. IBPS Specialist Officer Previous Year Papers preparation will improve the candidate’s confidence levels, time management skills, etc. Also, candidates can able to cover all syllabus topics at a time through IBPS SO Old Question Papers practice. We have mentioned the IBPS SO Asst Manger Last Year Papers with simple solution methods. If candidates can improve these methods, then they can able to solve the questions in their exam very easily. So, interested candidates can also use the provided IBPS Exam Solutions methods. We have also mentioned the Latest IBPS CWE VII SO Exam Pattern in the below sections. So, willing candidates can also check the IBPS SO Exam Pattern. Name of the Exam IBPS Specialist Officer Exam (CWE). Date of Exam (Prelims) 30th to 31st December 2017. Date of Mains Exam 21st January 2018. 1. Resoning 35 35 1 Hour. IBPS SO Exam is for 100 Marks. IBPS SO Exam has three sections. There are totally 100 objective type questions in the exam. 01. Proffesiciancy Test 100 100 1 Hour. Aspirants can download the IBPS SO Previous Papers in this section. 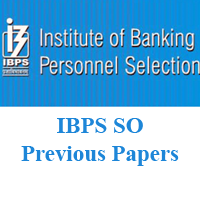 Below, we have provided all direct links for IBPS SO Old Papers Download. So, interested candidates can use the below links for IBPS Bank Exam Sample Papers Download. We have mentioned the Year Wise IBPS SO Solved Question Papers in Pdf format. With just one click on the below links, aspirants can obtain the subject wise IBPS Specialist Officer Exam Papers within seconds. So, applicants can click on the below links and download IBPS SO Sample Papers. Candidates can practice all provided IBPS Old Papers for effective preparation. Note: Candidates can use the provided IBPS Question Papers for practice purpose only. For more IBPS SO Previous Papers, candidates can stay in visiting this previouspapers.co.in web page.